Vacuum chambers manufactured from durable clear cast acrylic material allows for a full 360 degree view and are an idea replacement for heavy glass bell jars and cylinders. A common method of package testing, often referred to as a bubble test or immersion leak test (Standard test ASTM D 3078-02), utilises clear vacuum chambers such as our acrylic chambers and submerges the package under water. As a vacuum is created, air inside the package can flow through any existing leaks in the packaging resulting in a trail of air bubbles rising to the top of the vacuum chamber. Please note, this leak test method can only identify a leak, but cannot quantify the leak rate. Applied Vacuum Engineering can design and manufacture custom chambers are available to match your application specifications. Contact us with your chamber requirements. Dimensions: 33cm ID x 35cm O D x 40cm High. Clear acrylic base bonded to cylinder and fitted with three rubber feet. Clear acrylic lid with lifting handles. Clear acrylic perforated package submerge plate suspended by threaded studs allowing for adjustment of plate. 1/4" BSP Drain ball valve. Lid mounted 63mm dia glycerin filled vacuum dial gauge. Lid mounted air admittance ball valve. Side mounted vacuum inlet port with vacuum isolation ball valve. 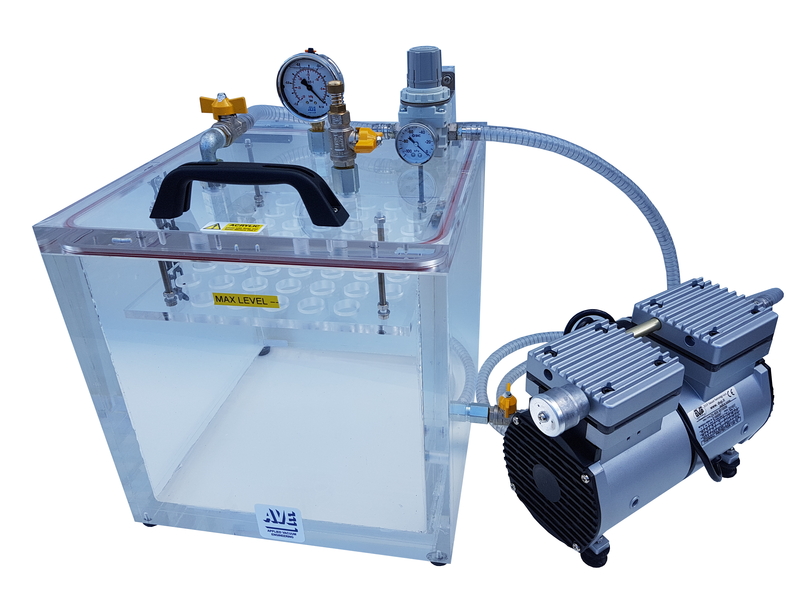 Side mounted adjustable vacuum regulator, 240 l/min maximum flow. Comply's with ASTM D 3078-02 - Standard Test Method for Determination of Leaks in Flexible Packaging by Bubble Emission. All sides and lid manufactured from clear cast acrylic. Internal Dimensions: 30cm x 30cm x 30cm. Rear hinged lid with O ring seal and chain restraint. Acrylic submerge plate attached to lid - Pushes floating packages under the water when the lid is closed. 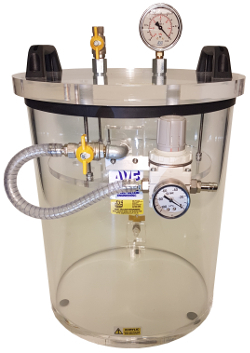 Mounted to the lid is a vacuum regulator (sets the vacuum pressure), a 63mm diameter vacuum dial gauge, air admittance valve, vacuum isolation valve and lifting handle. ​Vacuum pump (In the picture above is the DVP ZA.60S diaphragm pump). Dimensions: 30cm x 30cm x 30cm internal dimensions, 35cm x 35cm x 35cm external dimensions. All acrylic sides, base and lid. Silicon rubber 'O' ring cord fitted in lid. Hinged acrylic lid with lifting handle, air admittance valve and 63mm diameter glycerine filled vacuum dial gauge. Side mounted vacuum port with 1/4" BSP ball valve and hose nozzle. Lid mounted adjustable vacuum regulator. Dimensions: 36cm x 26cm x 17cm High internal dimensions, 40cm x 31cm x 22cm High external dimensions. Side mounted vacuum port with 1/4" BSP valve (not shown in picture) and hose nozzle.